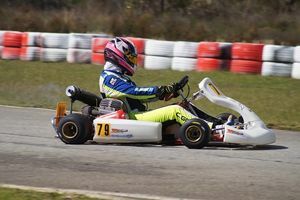 Southern Sprint – Albany City Kart Club 26th and 27th August. It was good to be back at the Albany City Kart Club for the first time in over 25 years. The track and facilities are absolutely brilliant. Practise on Friday was completed in fine weather, but unfortunately the first day of racing was to be completed under leaden skies on a very challenging track. The drivers acclimatised very well to the difficult conditions. The racing proved to be excellent and a fine shakedown for the State Championships which will be completed in just a few weeks time. Early in the week-end, this class was all about how far for Nash Ferraro. After qualifying on pole, he set about dominating the first three heats. 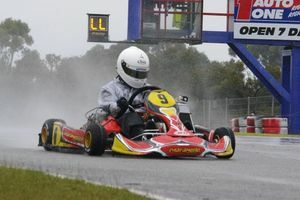 He was brilliant in the in the first two heats in the wet conditions on Saturday. Toby Maiolo won the third heat in drying conditions on Sunday morning with Ferraro in Second. Meanwhile, after an issue in qualifying, the reigning State Champion, Jackson Mitchell-Rosenaur had to start last in the first heat. 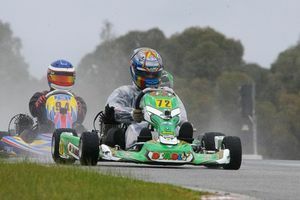 He steadily made his way through the field in the wet conditions to get himself a third row start in the final. He was just too good for the rest in the final. He only picked up one spot on the first lap and stayed fourth until lap 10.He then he took third place from Ferraro on that lap, followed by second place from Chase Wildman on lap 12. He assumed the lead on lap thirteen from Toby Maiolo on the second last lap. The week-end was about Caleb Sumich. 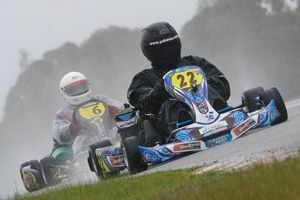 He was quickest in the wet and dry conditions and although Jack Clohessy gave him a great fight all week-end, he was able to prevail in the end. He won all the heats, but had to fight for each win especially the final. The other impressive display came from James Micucci-Allen. He had to fight his way back up the field from 14th, after a not so good qualifying effort. He was able to achieve a fine second place in the final after starting in sixth place. His final placing would have been third if it were not for some misfortune for the leader of the race near the finish of the race. That was due to race leader, Jack Clohessy’s unfortunate DNF in the closing stages of the last lap in the final. A dislodged chain put paid to Clohessy’s fine drive after a great tussle between him and Sumich. I was very impressed with Clohessy and Sumich all week-end. The are both fine young drivers and Clohessy in particular, will be great to watch as he progresses into Juniors next season. The eventual third placed driver, Ethan Flynn must also be mentioned. He too had issues in qualifying and started the first heat in 20th place. He sliced his way up though the field during the heats. He picked up eight places in the first heat and started in eighth place in the final. What a fantastic effort by him. Ryan Bender too had a difficult start to the week-end with start at the back of the grid. He too was able to get back through the field and have a great result. A great drive from last to first in the first heat set up his week-end nicely. Heat winners in this over the week-end class included, Bender, Dylan Ferfolja and Chase Hoy with other good work coming from Jacob DeCerqueira and Kieren Ellis. It really wasn’t certain which of these drivers were going to take out the class win. The State Championships in this class will be an interesting tussle because each of the above mentioned drivers has a good claim to be included amongst the favourites. It was an amazing turn around for Brock Kenny in this class. He was able to come back from an average start to the week-end. 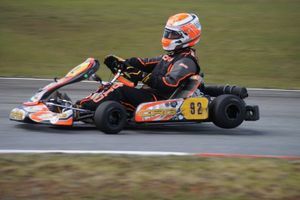 After Ben Harders dominated proceedings until the final, Kenny was able to find the sweet spot and take out what was proved to be an interesting final in this class. Many drivers had been in the thick of things during the week-end including Adam Levi, Jesse Thomas, Kip Foster, Harrison Oddie and Kenny. The racing was tight with Harders, Levi, Foster and Kenny all winning heats. No-one was sure who was going to take the class win as all the above drivers had all staked a claim for the class win. Predictably, the first corner in the final saw some interesting moves made with Foster, Oddie, Spouse/Nastasi and Pappasergio being amongst the more notables to sit out the final on the sidelines. It is a tight first corner at this track, but it was the only time we had this many drivers off on the first corner of a final. The State Championships or this class may see a different result and it will be worth watching. Jake Klarich, Alex Barboutis, Mitchell Perella Dan Curry and Tyler Spouse – Nastasi all drove beautifully in Kz2 over the week-end. But it was a great spectacle to watch the thundering Karts get round the wonderful Albany City Kart Club circuit. 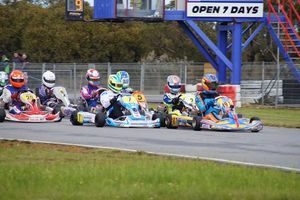 It was fast and furious all week-end and many drivers were still in the hunt for top three finishes in the Western Australia KZ series. The final saw several drivers including Barboutis and Perrella DNF. Jake Klarich took advantage of their absence and he took a great win ahead of Currey and Spouse Nastasi. I can imagine that Adam Cornick would not have expected to come out on top in this class at this meeting. He has been at the pointy end of the field on several occasions this year and in some instances was probably the one to beat. 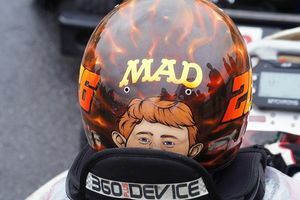 He did win the pre final and final after a seventh in the first heat and a DNF in the second heat. A complete turnaround after Nathan King had won the first and second heats. Daniel Clarke led on most occasions in all the heats, but did not quite finish the job in the end. He recorded second place finishes in each heat and the final. It was still a great effort from him. He still beat his dad, so that would have given them both a great deal of pleasure. Wins in each heat after qualifying in second place saw Daniel McCloud take out this class. He won each heat by over two and a half seconds, but took out the final by a much larger margin of almost six seconds. Lloyd Billick and Taylor Thomas challenged McCloud in the early part of the weekend, but overall he was just that little bit stronger. Ben Lee’DLimi was able to put together a strong performance in the final to take second place, but he was never really a serious challenger to McCloud, who won by a considerable margin in the end. Winners in other classes included, Sam Dicker in KA3 Senior Light. He was driving a prototype Arrow chassis and it seemed to do the job quite well. Spencer Stone dominated the class over the week-end, but unfortunately did not make it to the chequered flag in the final. Craig Spencer and Ryan Bender battled out the whole week-end in a small class of KA4 Junior Heavy, but it was Spencer who was able to take the win in the end. 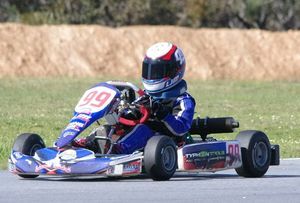 Max McCrae, Craig Spencer and Dylan Ferolja had a great battle in KA4 Junior Light over the week-end. In the end it was the ex rally ace’s son who was able to take a deserved win. Courtney Gough and Melinda Sully were the two stand-outs in Open Performance. The two drivers had vastly differing machinery at their disposal and it was a mechanical gremlin put paid the Sully’s efforts in the final. In the end though, it was still the first time that a female driver had won this class for quite a while. 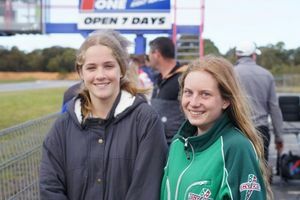 A fantastic effort by Gough and her parent Wayne and Rosalie, who have put in a great deal of time and effort to get the Twin Super on the track. I wonder how many of these Karts will show up for the State Championships. The track is a beauty and a great field of these Karts would be the highlight of the meeting. Scott Foster was the winner in KA3 Senior Medium after Dion Hounsfield won all the earlier heats. Brad Fitch was able to qualify in first place, but had an unusually difficult time in the heats. 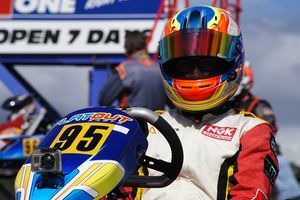 Two DNF’s did not help much, but he still struggled to get the Kart right for the conditions. Four drivers battled out for the top positions in KA4 Junior Heavy. In the end it was Craig Spencer who was to prevail. Despite a DNF in heat two, he was able to battle his way through the field to make it a second trophy for him for the week-end. 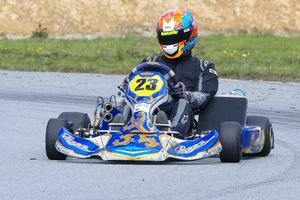 Other drivers to feature in the class were, Ryan Bender who won the first two heats but lost out the Spencer in the final two heats. Dylan Ferfolja was able to take heat two, but was not able to maintain the same level for the remainder of the week-end and Keiren Ellis who started the meeting with two second places, but faded slightly toward the end.